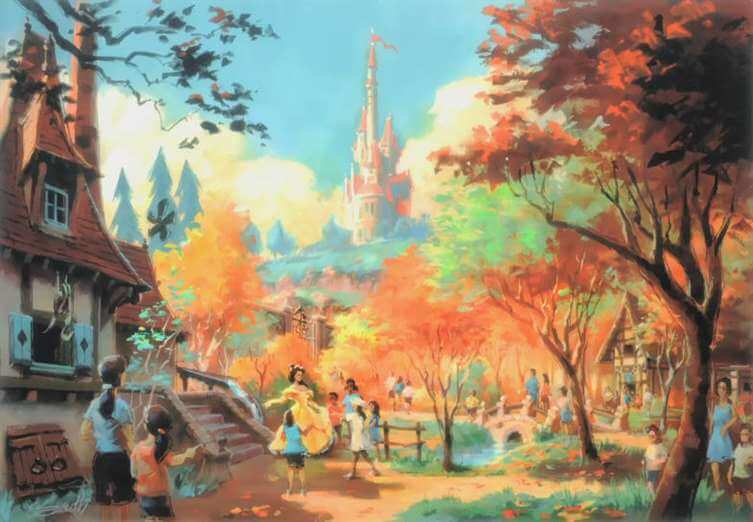 An early release including concept art has revealed new details Disney plans to announce at tonight’s Magic Kingdom media event surrounding the ongoing Fantasyland expansion. 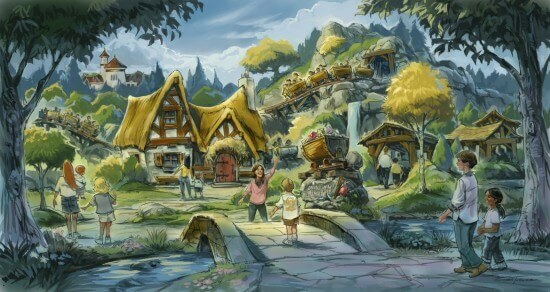 Now referred to as “New Fantasyland” and opening in 2012, the area will include several new attractions and other entertainment offerings. 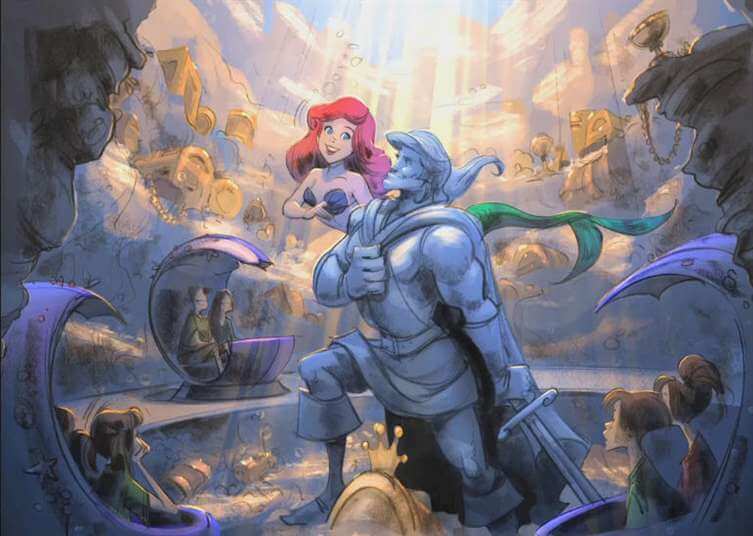 In addition to The Little Mermaid dark ride, a new roller coaster is indeed be part of the Fantasyland plans. The Seven Dwarfs Mine Train (below) will feature ride vehicles that swing back and forth, with each turn of the track. 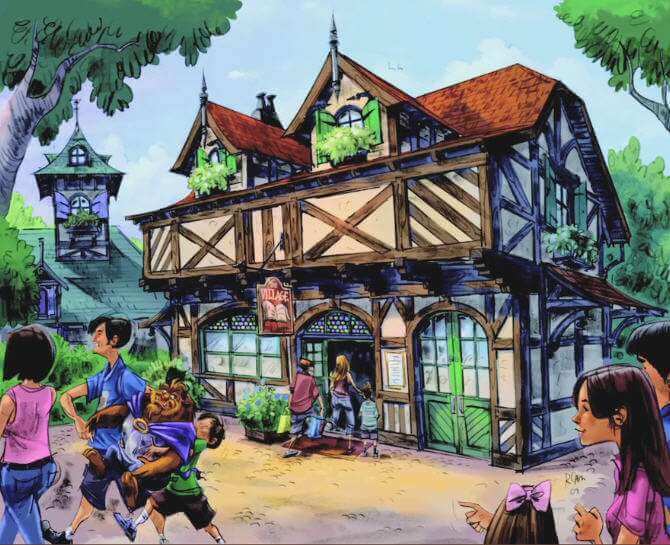 The ride will feature music from the classic Disney film along with animated figures of Snow White and the Dwarfs. Replacing Snow White’s Scary Adventures will be Princess Fairytale Hall, home to Aurora, Cinderella, Tiana, Rapunzel and other Disney Princesses. 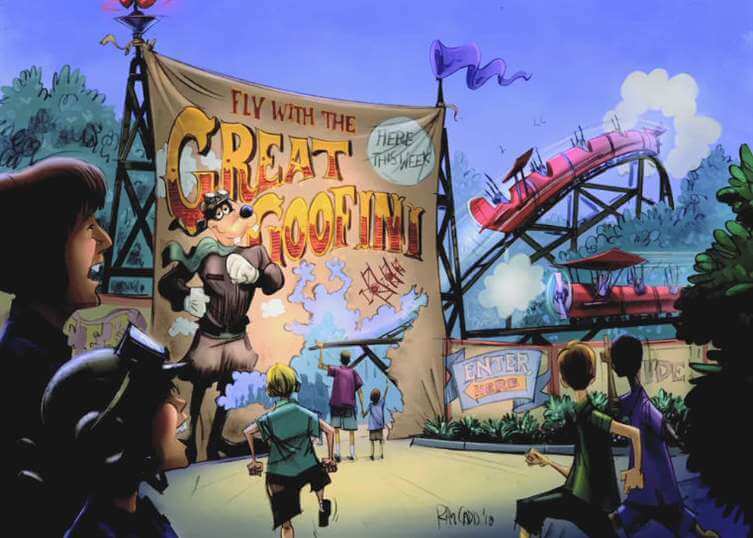 Toontown is receiving a circus makeover, with the Barnstormer roller coaster getting a bright new look featuring Goofy as The Great Goofini. 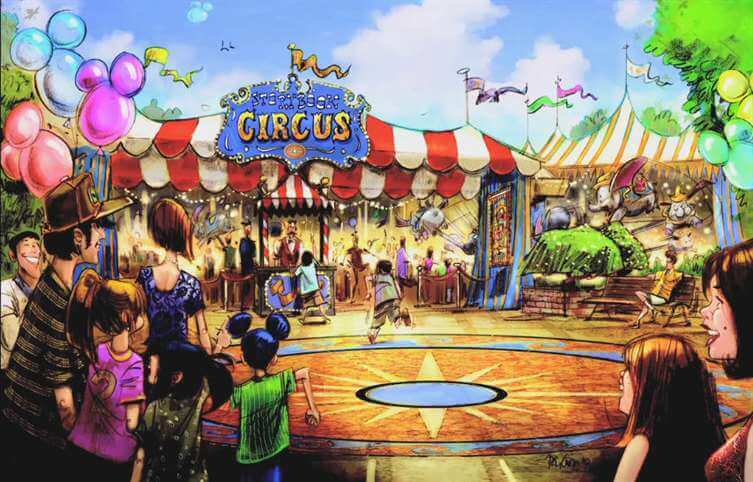 The new Storybook Circus will be home to the two new circling carousels of Dumbo the Flying Elephant. Family games and interactivity will be present inside the Big Top. In addition to these “New Fantasyland” announcements, Disney is proceeding with a Beauty and the Beast-themed restaurant and area and dark ride based on The Little Mermaid. 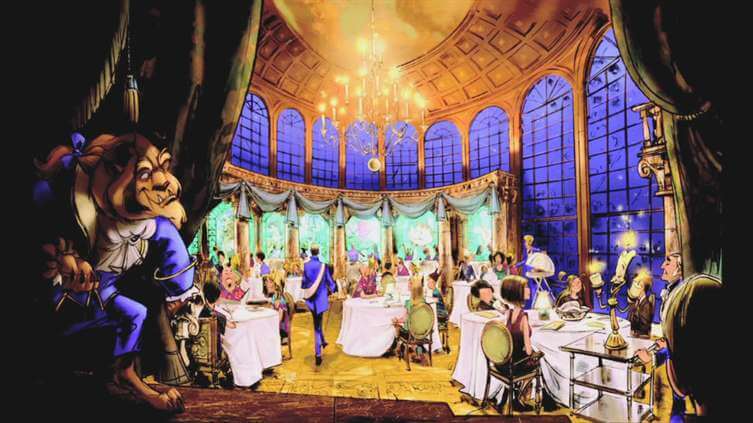 The “Be Our Guest” Beauty and the Beast restaurant will transform from counter-service during the day to table service at night. The Little Mermaid: Ariel’s Adventure will be a classic dark ride with updated technology and will be nearly identical on the inside to the same ride currently being constructed at the Disney California Adventure theme park. We’ll have more information as Disney announces it at tonight’s media event. the skyway is never coming back. sorry to say…. Will there be a livestream of this media event? Gosh everything looks so exciting, but I am afraid the views from Dumbo the Flying Elephant definitely won’t be the same. No live stream (that I’m aware of) but I will be posting to Twitter and Facebook with info and photos. exactly what i was thinking. i have a fear the dumbo ride is going to lose a little of its appeal. Ricky, just wondering—you aware of any plans to re-locate Scary Adventures? Hate to see it go away completely. It is leaving completely. I’m guessing some of the animated figures will be re-used for the Seven Dwarfs Mine Train. Hate to hear that, but it is nice that elements of SWSA will surface in other areas. Thanks for the follow-up, Ricky. Love the podcast. My wife and I are avid listeners. It seems it will be replaced. I will ask tonight if given the chance. 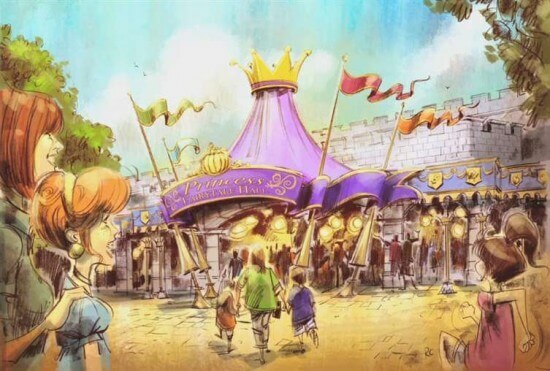 Please ask if the teacups are receiving an upgrade, as shown in the concept art. 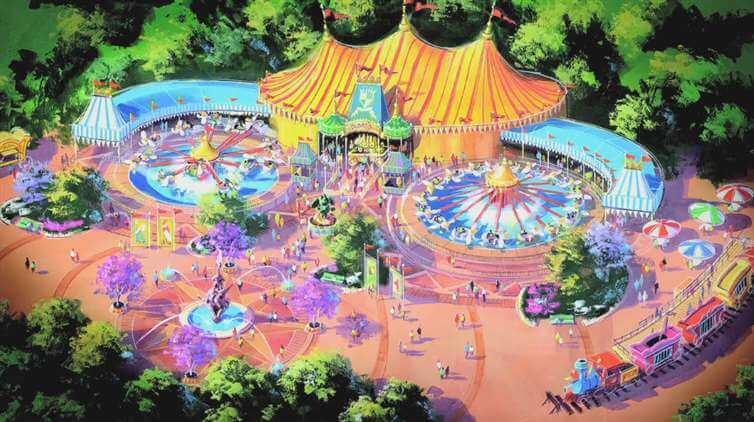 There is still a Casey Jr. style circus train in the concept art of the Dumbo area, but I didn’t read anything about it. Where can I find details about that if any? There are no details for that at the moment, but it likely won’t be a ride. Perhaps just a circus area display. The dual dumbos look like they will be right on top of Tomorrowland Speedway. And there have been reports of permits to change the lanes there. Do you think the FLE will affect the speedway layout? There is already some construction in the speedway area. What happened with pixie hallow plans? Gone? Forever or just temporarily? Do you mean they took out the spot in the store where the small pixie hollow was where you could get pictures with the fairies or that they just arent expanding on that. Disney has not specifically commented on where Tinker Bell and her friends will end up permanently. They’ll be at Epcot for a while during the Flower and Garden Festival. After that, it’s unclear. They may return to Storybook Circus or perhaps they’ll join the princesses in the Princess Fairytale Hall. But the previously-announced large, outdoor Pixie Hollow area is not part of the New Fantasyland plans any longer. The Pixie Hallow Plans are no more miton! So this expansion, does it mean all of Fantasyland is being leveled? I was hoping Disney would keep the classic Alice teacups, the Peterpan ride, Mickey’s Philar Magic?? Would these attractions be removed? Very little of existing Fantasyland is changing. Snow White’s Scary Adventure is the only ride that is completely disappearing. The Mad Tea Party, Peter Pan’s Flight, Mickey’s Philharmagic, the carrousel, Winnie the Pooh, and It’s a Small World will remain. The expansion is moving into the former homes of Ariel’s Grotto and 20,000 Leagues Under the Sea (years ago) as well as taking over Toontown. Thank You! For a minute, I thought it would be impossible for Disney to get rid of such classic and good attractions. Even if It’s a Small World is a bit annoying, but a classic nonetheless. Nice to see the one Imagineer got the plans de-Princessed significantly, but darn, was kind of looking forward to more of a “village”. Actually, if you recall, the infamous castle that starts each Disney film is meant to be Cinderella/Sleeping Beauty Castle. That means that Cindy and Aurora could technically live there with their Princes if need be. What is going to happen to minnie and mickey’s houses are they going to be destroyed? It’s possible. Disney has not specifically commented on the future of the two houses, but either way Mickey and Minnie will not be meeting and greeting in Storybook Circus, but rather in Exposition Hall in Town Square. Does this mean that the mice WON’T really HAVE a home, but be stuck in some theater display for their meet-and-greets from now on? Kind of depressing, since you would think the mice that started everything deserve some kind of home, NOT a workspace! I read that there will be interactive games in the big top area. Will they be similar to the ones in animal kingdom, where you have to pay extra to play the games? You won’t have to pay extra to play anything in the Dumbo queue / big top. It’s all part of waiting in line without waiting in line. the new fantasyland is going to be nice when its all done.first the mess then the new fantasyland to see. I’m glad that they did this. The whole princess thing only appeals to certain people, and that would not be me. The re-theming of Barnstormer is good, too. It’s a good thing that they didn’t just slack off and make it Sky School like in DCA. I’m so happy to see more for Snow White at Disney. My daughter loves her, not Cinderella! It’s almost impossible to see Snow White at Disney for a meet and greet. YAY Snow White!!! It’s about time. will princess dining still be happening at cinderellas royal table at the castle for 2013? What type of ride is the SWSD ride? They say “roller coaster” but is it an adult roller coster (Space Mountain, Aerosmith’s Coaster) or more like the Run A Way Train (Goofy’s Barnstormer)?